On Monday you asked this question on Twitter and seemed quite flabbergasted about the situation, so I thought I’d do you the favour of writing to you with some answers so you don’t do what you threaten and completely give up. Because we need you! Firstly, as you were told in response to this tweet, in fact the figure isn’t half, but more like a third, outlined by Greg Jericho on Thursday. So why don’t a third of the working population pay any income tax? If you think hard enough about this question, the answer might come to you but I’ll just tell you to save you the mental energy: it’s because a third of our working population don’t earn very much money. In your career, I’m going to assume you’ve never earned so little that your annual income was below the tax-free threshold, except maybe when you were a teenager or perhaps a university student. At this point, I just want to clarify that you’re upset about the people who don’t pay income tax because they earn little, and not the millionaires who pay no income tax? Am I right? You’re worried about the people like Duncan Storrar who don’t pay income tax, but as Duncan cleverly pointed out, do pay GST and petrol tax, which has a much larger impact on his overall income because this tax is such a large chunk of his income since he earns so little? Glad we cleared that up. If you read the comments on Jericho’s article, you might think people are upset with you, but I think they all misunderstood. Really, you should be applauded for being so concerned about the sustainability of this situation, because you’re right! It’s not sustainable to have such a large portion of the population earning so little and the government really should do something to fix this problem! I can see now you’re campaigning to raise the minimum wage, and you’re saying we most definitely should not be paying young people $4 an hour as that’s just going to entrench them in a cycle of poverty of which they may never get out. You’re also obviously saying that workers deserve a greater share of profits, since they’re the ones doing the work, instead of all the spoils going to the shareholders and over-paid executives which is entrenching wealth inequality. I agree Peter! Good on you. Good on you for making this point and don’t you ever give up making it. You should, Peter, however, be very careful to make yourself more clear in your standing up for the little guys, because it’s understandable that your concern was taken out of context. This context is the world of your right-wing-buddies (where you are apparently a moderate?!?) who are busy using stats like you’ve used to argue that half the population, who pay income tax, are supporting the other half of the population who don’t pay income tax. This rhetoric leads to the narrative of the haves supporting the have nots, the lifters supporting the leaners, the hard-workers supporting the bludgers. Don’t get me wrong, we’re used to being outright told by the likes of you and your political bed-fellows that the unemployed are a drain on the up-standing-tax-paying members of society, but it’s coming as quite a shock, I must admit, that the ‘drain’ narrative is now being applied to poor workers as well. It doesn’t make much sense to me that people who go to work and earn very little for that work should somehow be framed as the problem in our society. Apart from the fact that this vilification ignores the valuable contribution many low-income workers make to our society, contribution which you, no doubt, place no value on, but for which the country wouldn’t survive without such as looking after people too young, old or sick to look after themselves, or volunteering in their local community. Two year olds are too young to go to work, you are no doubt disappointed to hear, and they’re not very good at looking after themselves either. You were two years old once Peter, and I’m sure you weren’t left to fend for yourself. But I digress. Apart from this un-paid and under-appreciated contribution, which by the way is mostly made by women, as any credible economists will tell you, the economy is 100% reliant on its consumer base, which is made up of both people who do pay income tax and people who don’t. Low and middle-income workers have to eat, have to feed their families, have to buy clothes, petrol, pay rent or mortgages, have to exist somehow and existence costs money. This is the very same money, out of the pockets of the poor, out of the wallets of the minimum wage earners, which flows into cash registers, into the economy, into the tax system, and eventually a chunk of that money flows into your wallet, into your pocket, into your privileged world where you can’t even imagine not being able to afford to go out to dinner with friends, to own your own home, to buy a car, to wear expensive suits, to take your children to the movies, to have an iPhone, and probably an iPad where you send snarky tweets, where you voice your outrage at the unsustainability of a system stacked against low-income earners. I could also note that none of the spending of these people, who have so little that they spend everything they earn, none of this spending leaks out of the economy into unproductive activities like speculation on the stock-market and tax-avoidance in Panama. Just saying. You should more careful about what you say Peter, and careful what you wish for. I agree that it’s completely unsustainable to have so many people in society earning so little and the rich taking all the spoils and the investment properties for themselves. Wealth inequality is bad for all of us. I look forward to you using your television show to campaign about this issue in the future. http://www.abc.net.au/news/2015-12-17/almost-600-companies-did-not-pay-tax-in-2013-14/7036324 that the LNP have taken no action to recover “our” taxation money from those who can well afford to pay is absolutely scandalous, some of these bludgers make donations to the Liberal Party which also must be very easy given you have not met your responsibility to pay a “fair share” of taxation to the country which hosts your business. As the story goes on to tell us they haven’t paid “any taxes” since their mates came to government, a great reason to oust them at the coming election. Some say that robbing our Treasury of billions of dollars year after year is treasonable as well as not moving to close the loop holes. I am so impressed! What artistry with words and thoughts you have, Victoria! 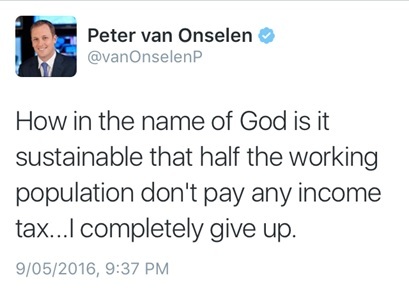 Perhaps I live a sheltered existence, but I have no idea who thise Peter van truck is …… he has a television program? ?